Disclosure: Occasionally, this writer receives items to facilitate a review. All opinions are her own. It’s a phrase that moms dread. The project, the craft, the something elaborate is due tomorrow. Somehow, some reason or fabrication, the teacher assigns a project that needs crafting done in a day. No, I’m not talking about the 2 month project that your kid forgot (yes that happens too). But, those last minute projects are the ones that make moms scream. Having a basket of Wescott crafting supplies on hand is the mom salvation. First, I am not a crafting person. I like lines, neatness, order, etc. I don’t spend time scrapbooking or searching pinterest for the perfect crafting idea. In my world, I’m about convenience. If I could buy the finished project, I probably would. For me to have crafting supplies on hand means that the products must be easy to use, otherwise they wouldn’t be in my house. 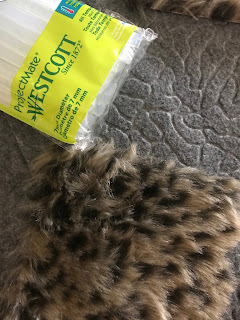 The handful of my Wescott crafting tools are exactly that, easy to use. Specifically, the glue guns. Have you ever burned yourself on a glue gun? I have. I swore that I wouldn’t have another one in my house after the last burn incident, but now I’m sold on this thin glue gun. Previously, my biggest complain about glue guns was that too much glue came out. Big globs would be a hot mess, literally. With this glue gun I can control the smallest amounts of glue. It is simple and easy, especially for this non-crafting mom. 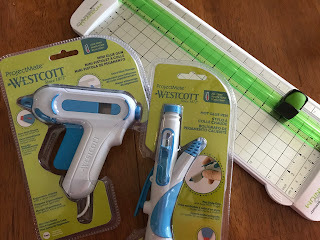 We used this glue gun on two last minute projects in our house. In the “due tomorrow” file, my son came home with great news. He was a finalist for homecoming prince. Great, but he needed to make a campaign poster for the morning. That’s right, after a long school day and a high school swim meet, we had to make a poster. Time to break out the glue gun, paper cutter and glitter. Luckily I had everything in the office. With the Wescott paper cutter, I knew that we could ensure straight cuts for the whole project. But, the cutter doesn’t stop there. It has a scorer feature. This feature lets you mark an area with an indentation without actually cutting it. It is perfect to make straight lines for adding elements. For example, we used the score option to make sure that the letters and picture were lined up. The little, non-visible line provided the straight surface to line up the printing. Simple, easy and done. 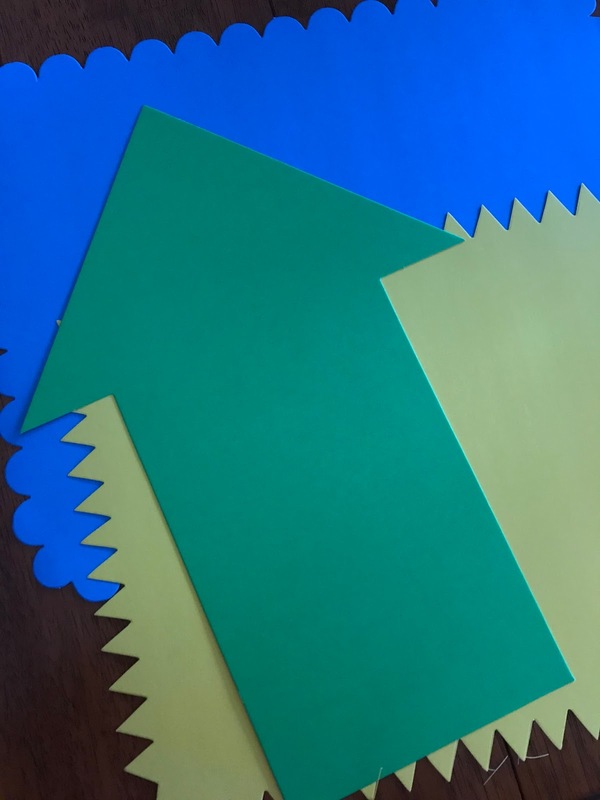 While the Wescott paper cutter is works for cutting shapes too. We made all types of arrows, borders and designs. While rounded cuts aren’t the best, arrows and triangles are easy. Plus, this cutter is much faster and easier than regular scissors. Of course, the glue guns made sure that everything stuck and nothing fell off. From the heavier photo to all the glittered letters, I had great confidence that the Prince would still be Prince, not Rin or ince. But, posters aren’t the only use for these crafting projects. My other son had been working on an original book for his language arts class. What he neglected to tell me is that the book had to have a real cover. Extra points were given for a creative cover. Bring out the supplies. Since his book was about the big five animals on safari, we wanted the book’s cover to look like animal skin. We took some grey felt and some fake fur to create the cover. The materials covered a sturdy folder. Plus, we even scored the felt to make it look older, like an elephants hide. The final product looked pretty good. Bonus, he got an A on the project. These two simple examples show that anyone can craft when they have the right products. These Wescott products, like the paper cutter and glue guns can make anyone feel at home in the crafting world. I may not be Martha Stewart, but I won’t end up on the Pinterest fail channel. You are a beginner but a very fast learner. You are not sure if you should buy figure skates at this time. However you feel you are progressing fairly quickly. You have made it to freestyle levels. Now the big question is should you stop renting and buy your own pair of figure skates.I find this website women's walking sandals. You can visit this site.